A 100 per cent fit-for-purpose tool of our trade. This thinline semi is smartly made. Excellent weight, feel and sounds. It’s not bringing anything new to the table and not everyone will enjoy the headstock. Get over it! The H-535’s inspiration is blindingly obvious and it features that Heritage headstock, which is 17mm and untapered, probably due to its smaller size, unlike the classic guitar it clones. 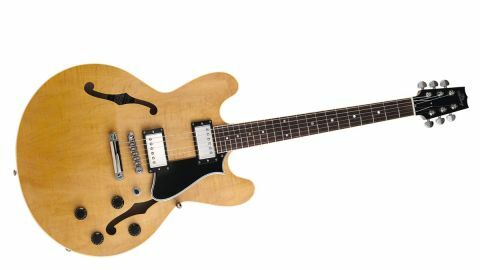 It’s relatively light in weight (3.51kg/7.72lb), something that can’t be said for many contemporary ES-335s we’ve had through our hands in recent years. It uses a three-ply figured maple-faced pressed laminate for the top and back, while the sides - as they always have been on this Heritage model - are solid figured maple, bent into shape like a solid-sided acoustic, along with quite large mahogany kerfed linings. The centre block is maple with spruce ‘pads’, as Heritage calls them, to match the curve of the top/ back to the block. The rise of the top and back seems slightly flatter than anything we have for comparison, with a fairly common rim depth of around 42mm, which actually appears smaller due to the deep (8mm) single-ply binding, and an overall depth of around 58mm. Along with a neck pitch that means the tune-o-matic sits virtually flush to the body there really is a lovely classic guitar vibe here that’s very nicely done. Actually, ‘nicely done’ pretty well sums up the build of this guitar, not least the neck. As supplied with a string height of 1.2mm on the treble side and 1.5mm on the bass, and measured at the 12th fret, it is a little too low for us, but the fretwork is immaculate with slight and well-shaped nibs to the fret ends, while the medium-gauge wire is around 2.6mm wide with a low, classic height of a shade over 1mm. It uses a Grover tuner, a TonePros-style die-cast zinc locking stud tailpiece and an aluminium Nashville-style tune-o-matic with titanium saddle and slot-head post caps to lock it firmly in place and made, we believe, by Advanced Plating in the USA. Don’t expect any surprises here. Like the classic build the guitar emulates, it immediately hits the spot, from the crisp ring and vibrancy unplugged, to a neck that feels like many you’ve played before and enjoyed, and a huge sense of overall familiarity. Plugging in, you notice its output jack is sensibly side-mounted (not top-mounted), but, really, aside from that, it does ES-335 to a T, treading that middle ground between solidbody and hollowbody and creating a hugely unique voice that balances snappy, percussive old-style electric blues with surprising meat and power. Setup is superb, not least the beautifully cut Corian nuts. And, to be honest, aside from slightly raising the string heights, we’d take this guitar straight to a gig and not look back. It really does what the tin says - effortlessly.